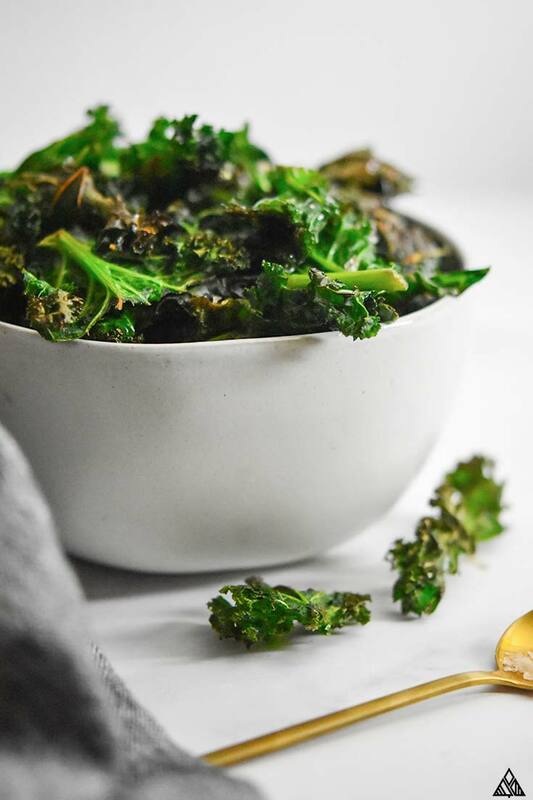 Kale Chips - Crispy, Crunchy, Salty, Deliciousness! 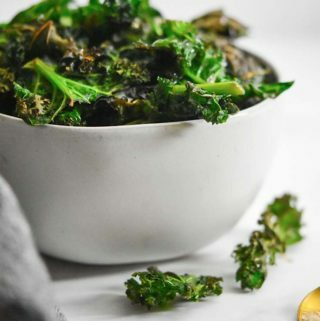 If you’re craving some crispy, crunchy deliciousness, then look no further than this kale chips recipe! They’re totally delicious, come together in the blink of an eye, and WAY lower in carbs / higher in nutrients than traditional chips. The snack of dreams. Kale chips healthy has the perfect texture for a chip alternative. These awesome, low carb snacks pair really well with other low carb foods for a great meal or healthy snack spread, so you don’t feel like you’re skimping on the “good” stuff! 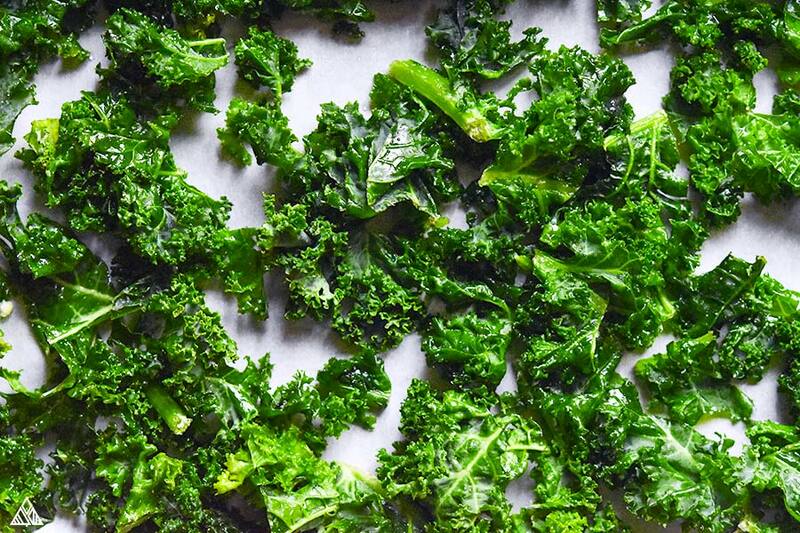 These garlic kale chips only require a couple of ingredients and come together with just a few steps — plan for 10 minutes to prep and 10 to bake. Simple, quick, and delicious! Before getting started with today’s baking adventures, you’ll want to thoroughly rinse the kale, and dry them as best you can before moving on to the next steps. 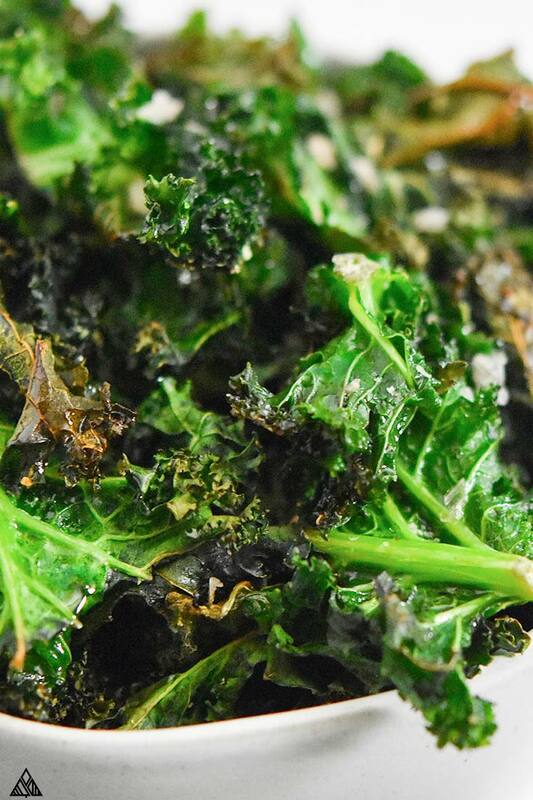 For the best results, rinse and dry your kale the night before you plan to roast them. Simply wrap them in a towel and leave them to dry in the fridge overnight. This makes for the crispiest chips possible. Next, chop off the thicker stems of your kale and chop the leaves into chip sized pieces. Be aware that as they crisp in the oven, they’ll shrink a little. Finally, you’re going to toss together your kale with the oil and seasonings until everything’s coated and ready to place in the oven. For the best crispy chips, you’ll want to spread the chips among a few baking sheets so they aren’t overcrowded on your pan. This helps to make sure they brown and crisp, instead of steaming from the moisture that gets caught between the kale chips. Can You Dip Kale Chips? Some kale is thick, so when it bakes it’s strong enough to scoop up the awesome goodness of a tasty queso or veggie dip. However, some of these chips bake down and become too thin for dipping. Because of this issue, I look carefully at the kale before purchasing. If I’m making these for party time to serve with low carb dips, I make sure to grab the thickest looking kale. 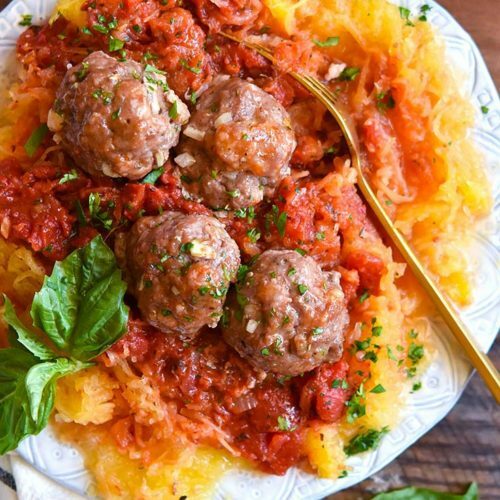 If I’m serving them as low carb side dishes, it doesn’t matter as much. 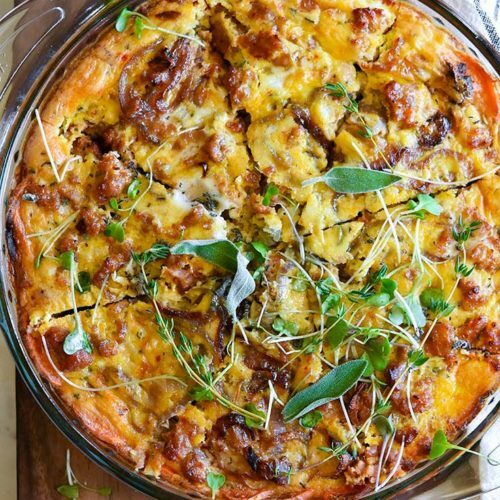 As part of a meal: Throw together a low carb shopping list that’s loaded with healthy proteins like chicken, tasty greens like spinach, and keto vegetables like cauliflower. For a buffet style meal, pair this baked kale with low carb vegetables that combine into a fantastic veggie tray with dips or side dishes like cheesy cauliflower. 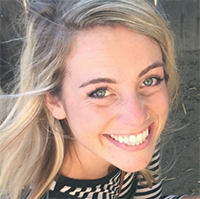 Snacks: I like to pair baked kale chips with any of my favorite low carb snack ideas. To name a few: cheese crisps, cucumber sandwiches, and ham and cheese roll ups. The combination of these snacks makes for a great party spread. And of course, these chips can always be served a-la-cart as a simple quick snack for movie watching or game going. You can spice things up by adding a hint of cayenne pepper into the spice mix. A half teaspoon is enough to add some fire, while a full teaspoon will add the flames. Another favorite is turning the garlic chips into parmesan kale chips. 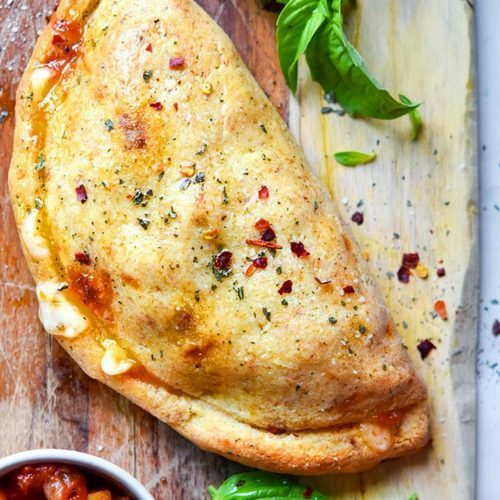 While they’re still warm from the oven, sprinkle some parmesan cheese lightly over them. Don’t go too heavy or they won’t remain crispy. For a unique twist, sprinkle some yellow curry powder into the seasoning/oil mix before tossing it all together. Make sure you don’t use more than about a half teaspoon, as too much curry can overpower the other flavors. This recipe is for baked chips, but kale chips dehydrator recipes exist, too, if you aren’t in a rush. Some recipes make kale chips without oil, though I like the boost of omega-3 fatty acids in the olive oil. Allowing them to cool completely, then place them in your best meal prep container. I prefer this to resealable bags, as they protect the chips from breaking apart. Stash them in the fridge. 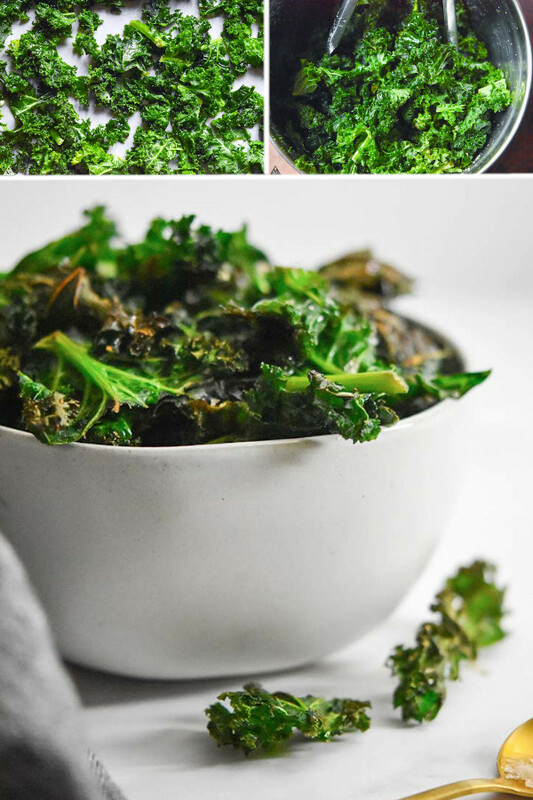 Hope you enjoy this kale chips recipe! Let me know what you think in the comments below — are these the cure to your salty, crunchy cravings?! 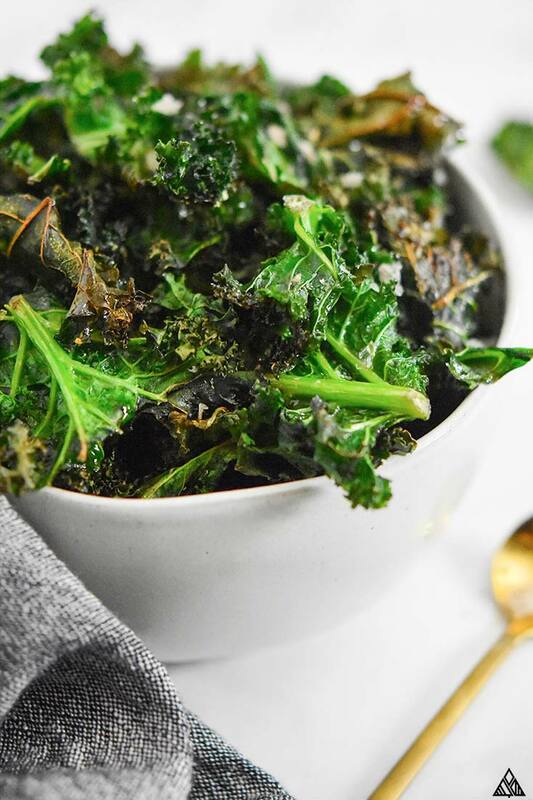 If you're craving some crispy, crunchy deliciousness, then look no further than this baked kale chips recipe -- The perfect low carb + keto snack! Preheat your oven to 350 F, and line a baking sheet with parchment paper. 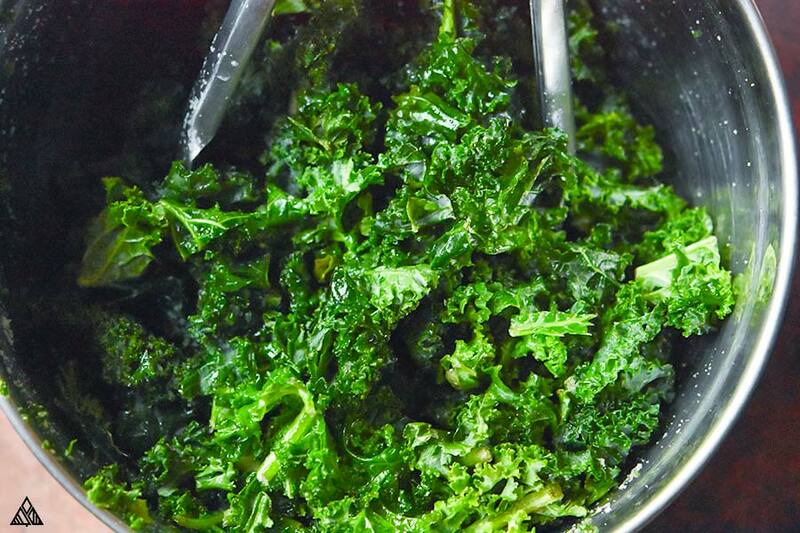 Rinse your kale, and wrap the leaves in a dish towel so they dry completely (this can be done the night/day before). Remove the thick stem from the center of your kale, and chop the leaves into chip sized pieces. Add kale, olive oil, salt, pepper and garlic powder to a large bowl, and toss to evenly coat. Spread onto a prepared baking sheet — if you want crispy chips, do this in batches (this took me 3 pans), as over crowding the pan will “steam” your chips instead of crisp them. Bake in the oven for 12-14 minutes, or until brown. Enjoy! « Low Carb, Paleo Potato Salad – Turnips + All the Goodies!